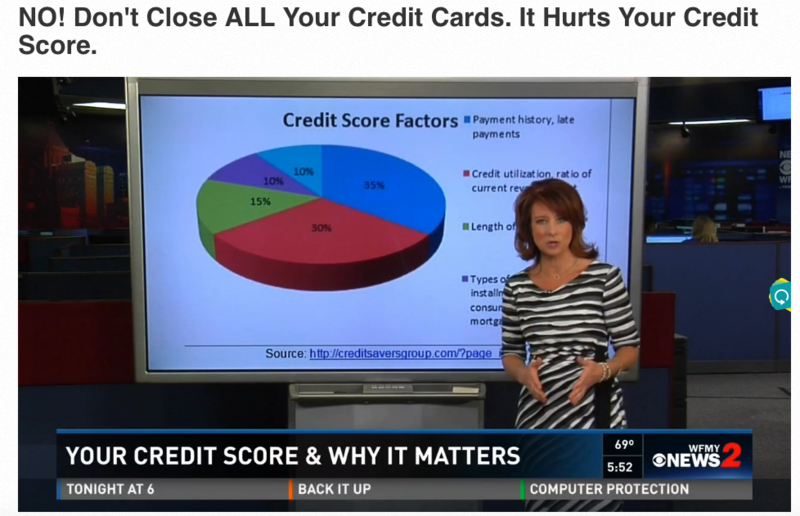 My WFMY interview on Credit Scores. Click here to view my interview Your Credit Score & Why It Matters. Often times we hear about credit scores. Unless you have taken a loan or are planning to take a loan, they usually do not feel that they are that important to you. I want to explore credit scores further so that you can be improving yours even if you are not planning on taking a loan any time soon. A lot of people think credit scores are some magical number that comes out of a computer somewhere. They are partially correct. Many people are surprised to find out that they have bad credit when they have never really used credit much in the past. This is called a thin file in the credit world and it means that you have too little history in your credit to gauge your creditworthiness. I remember a friend who moved to our country who could not lease a car for two years while studying here even though he was making all of the payments up front. The reason they would not allow him was that he had no credit history in the US. If you look below, you will see the factors that go into your credit score. Your payment history and late payments, ratios of debt and length of credit history all come into play. If you have no credit history, like my friend, you are limited. There are many things that are effected by a bad credit score. You may be looked over for a job, have to pay deposits for utilities, or most importantly pay much more in interest for something you are taking a loan for. The costs of bad credit are extraordinary and the chart below is a great way to see how bad credit can cost you a lot of your hard earned money. A person who is looking to buy a home who has a credit score of 500 to 559 in the example below would have extra monthly mortgage costs of $1238 a month. That is an awful lot of money to pay for bad credit. While it seems exhorbitant, it is based on your history of repaying debts and the risk associated with loaning you money. That means that the rules won’t change just because it seems unfair and it is up to you to monitor and maintain a good credit score to keep your costs of borrowing money low when you do decide to take a loan. How Can I Find My Credit Score? Be sure to avoid imposter sites for fear of giving your information out to the wrong people or being charged for something you should receive for free. Now that you see how important a credit score is, what can you do to improve yours? There are a few obvious ways to improve your credit score. The first is to pay your bills on time every time. The second is to build a credit history for those who do not have one. A great way to do this is to use a credit card wisely at a young age and build up a history of paying it off. Another way is to not open too many lines of credit or take too much debt. When my wife and I got married, I made a mistake regarding her credit. She had amassed a lot of cards. While none of them had a balance on them, she had cards from multiple retailers and other sources. Thinking I was simplifying her financial situation, I encouraged her to close them out only to discover that I was inadvertently hurting her credit score. This was a minor mistake and did not cause a huge problem but it was my first education that some things regarding your credit score are counter intuitive. So now that you know all about credit scores, go check yours and take the steps to improve it as it can help you keep some of your hard earned money. Feel free to visit my website at www.mattloganinc.com or email me at [email protected] if I can be of any assistance. Also, I would love to hear about ways that you and your significant other handle financial disagreements.